In stark violation of principles of good governance, the management of the state-run Associated Newspapers of Ceylon Limited (Lake House) has ordered all its publications to refrain from carrying former President Rajapaksa’s “Medamulana statement” as the lead story on Thursday (July 02nd). All the newspapers in the country, except Lake House publications, carried former President Rajapaksa’s statement as the lead story, considering its news value. On July 01st, Lake House Chairman Kavan Ratnayaka and Director Editorial Saman Wagaarachchi had come under pressure from the Prime Minister’s Media Unit, headed by Saman Athaudahetti, over a picture of Mahinda Rajapaksa carried on Page 01 of the Ceylon Daily News. Colombo Telegraph is now in a position to reveal that the Prime Minister’s Media Unit had exerted pressure on the Lake House management after UNP Chairman Malik Samarawickrama informed Prime Minister Ranil Wickremesinghe about the page 01 picture of the Ceylon Daily News. This is no different from the system adopted by the Rajapaksa regime to control the state-run newspaper company and to make it a mouth-piece of the previous government. Under the Rajapaksa rule, no editorial independence was given to Lake House and mere political stooges were appointed as Editors. The Elections Commissioner requested all political parties to desist from using state resources and public properties for their election campaigns. Recent developments in the state-run newspaper company show that it is not willing to adhere to parameters set by the Elections Commissioner for media. Apart from controlling Lake House to benefit the election campaign of the UNP, the government did not any action to pass the Right to Information Act in Parliament before its dissolution. Right to information was an integral part of the 100 day progamme presented by Sirisena-Wickremesinghe government. On the other hand, Foreign Minister Mangala Samaraweera, some months ago, said he would present a special report disclosing actions that were taken to news websites, including Colombo Telegraph, under the previous regime. Samaraweera’s “special report” too did not see the light of day although the new government stayed in power for six months. When asked whether there was any instruction from the Prime Minister’s office to refrain from carrying the former President’s speech as the lead story, Lake House Chairman Kavan Rathnayaka declined to give a direct answer. “I read Colombo Telegraph but I don’t question you,” he said in response to our question. UNP Chairman Malik Samarawickrama was not available to comment. Kavan Rathnayaka was a highly respected person in the private sector. Why is he tarnishing his own reputation by getting into this pool of mud? We expect him to protect his dignity and integrity without turning himself into a dishonest and corrupt political stooge like Bandula Padmakumara and Hudson Samarasinghe. Definition of dishonest and corrupt political stooge: uttering, writing or behave in any shape or form that could not be politically advantageous to Ranil My3 Chandrika thunkattuwa. We citizens are grateful to you for the yeoman service you have done to get rid of the Medamulana crocodiles from the Government of this country. However they are now trying to get back the government, to start ravaging the country again. An election is coming up. We do not want them to be given any chance to do that. Government publications will be used by their lackeys to brain wash the people. Until such time as the Crocodiles are done and dusted (and buried) it will be necessary to deny publicity to them. If indeed the Prime Minister has contributed towards this goal he deserves to be complimented. Is this the replay of movie Dr Cooks Garden? end justify the means.Now one can argue CB governor corruption case is some sort of a getting even with former regime.No wonder Sri Lankans elected Percy Mahendra.Some excuses are same old carbon copies of Rajapaksa supporters only difference old tripe been recycled by new regime supporters. Be carful what you wish for.Regarding news paper “Daily Good News” all they have to do is carry on as Rajpal did change the names praise the new regime for sterling work any decent call them out as traitors that worked for Percy Mahendra and co, for a while no reason why it wouldn’t work for the new regime judging by some comments its already well on the way. Well done CT. I would like to thank Colombo Telegraph for being impartial in spite of this site was blocked during previous president period. Sri Lanka need impartial media which provide service for common people and not for politicians. Ranil is just another Mahinda if he do same thing. If mahinda is wrong ranil should use legal institutes to take actions against Mahinda’s wrong work. Think about ordinary working people. Sri Lankan politicians come, then earn and Go. Earn more than they give to country. Don’t you think why didn’t 100 day government take any action against previous regime ?. They know if they take action when government change upcoming government take actions against 100 day government’s wrong work. This process continue in Sri Lanka. Every coming government use wrong work of previous government to obtain power then protect them from legal punishment. Common people don’t get any benefit. I have seen Chinese and Thailand politicians are in prison-ed for corruption why Sri Lanka is not doing that. you must support democracy and not politicians. In this case Ranil have gone against democracy. If that is the case where has Ranil parked his white van fleet? @Native_Veddah, Ranil is using the same car park that Premadasa used.Anyway, it’s Early Days yet. White Vans are not strictly a democratic issue, is it ? After all, the President of the self-styled Greatest Democracy in the World still indulges in picking out citizens and non-citizens who get to live or die and kill them off by remote control. Is that Democratic or Not ? Are we worried about good governance and complying with rule of law of this island or about other countries? Please leave us to deal with our immediate problems as you know we have limited time and resources. If you really really want to change other countries you better do that, we will be right behind you. On the other hand if you want this island to compete with others and hit the bottom please feel free to do that as well. That is what the so called leaders have been doing in the last 67 years. We know people are stupid however they are not that stupid. It’s very difficult to clarify these people. MR is not a good guy but RW also have worst past compared to MR. I was to tell that but I was lazy because if that vedda has at least some knowledge it’s very easy to understand what you have said. Ranil was good to stop MR’s unstoppable political journey but when he do the same thing it’s very dangerous(More than Mahinda). However president Maithripala Sirisena is better compared to all above mentioned people. So he must concern on these issues. In which case, what is the difference between “Medamulana crocodiles” and the current administration ? Both used/are using Lake House to promote themselves. And you are saying., “sure, that’s fine”..
Of course, Lake House needs no lessons in making 180-degree turns at each election since they have been doing it for the past 40 years or so ! If you look at their reporting 6 months ago vs. what they report now, it’s almost comic !!! This election will show the role of IT and modern communication Tech in taking the truth to the people. And the people attitude towards humanity,human civilization, fairness and justice. The Act was not passed, so they are withholding information. However, everybody Else is publishing. So how effective is that? It is doing more damage. Did Mahinda Rajapaksa win with all those restrictions and censorship? No. Who said Modayas are restricted only to the Mahinda Rajapaksa Camp? They are everywhere, including the UNP. How little the rotten UNP has changed over the last 65+ years. In case you were giving them the benefit of the doubt. PS: Why do we need so called “State Media” run by poltical appointees? So shamefully biased. Like in the Soviet Union. I thought we were an open, democratic Republic. BTW, isn’t this the age of social media? Many commentators argued that once those terrorists had been anguished everything was going to be hunky dory. The problems associated with this island is much deeper. A complete restructuring is over due. Without people being vigilant and their active participation you are rest assured nothing would change, more of the same. We demand voting rights and clean elections, once the elections are over we retire for the next 4 or 5 years. We are contented as if we have truly done our duty. We refuse to engage with people, learning from them. What we discuss here does not mean anything to them. The people tend not to question the politicians, out of fear or falling out of favour. When the state is (democratically) centralised people depend on their political leaders to arbitrate over distribution of scares resources and state control. Over the past 60 or so years we have created a rent seeking rulers, bureaucrats and political parties. Now the problem is how would one go about dismantling the structures of this well entrenched rent seeking society. Regime change is not the panacea for all ills. It gives you limited space and time. You should think about it and hope your brother Jamis Muthu Banda could constructively engage with you and contribute to the discussion. Wish my angry “brother” with a twisted mind, J. Muthu could be as constructive as you are. He is Jamis Muthu Banda. Why can’t a Sadu ear Monk fish? You are a real Mokkan (mad fellow). According to Amarasiri, Mokkan = Modaya = Idiot/fool. Could you verify its meaning with him. Mad fellow = விசரன் (Visaran) = பைத்தியக்காரன் (paithiyakkaaran)= පිස්සු සහෝදර (pissu sakothara). Thank you for trying to educate the Mokkan. Hope you too have benefited from it. Why couldn’t this thrice blessed island produce a Gandhi, Mandela or a Lincoln. Unbiased news coverage does not mean unfettered prominence to MARA on the first page of all dailies. I am sure there are still shills of MARA in important places giving undue prominence to a goner. It needs to be kept in check. I do not also condone Ranils picture in place of MARA and I am sure that will not be the case. Balanced coverage is what is required.For that people of good standing is required. Unfortunately that is a tough call in the immediate aftermath of the most corrupt rule ever in Sri Lanka. Corruption has become a cancer in our society and it needs time for healing. All praise belongs to MARA for the legacy left behind.Mahendran also has contracted that desease and needs immediate treatment. Ansar, what credentials do you have to teach journalism to CT? The whole lament you have made here is nothing but blind hypocrite towards MR. He too deserves a balance coverage from the state media outfits. Under what democracy you deny that right of MR you one-sided moron who talks lot but, at the end, just a fart! All these bastards are the same. UNP is no different but in fact we have had the worst anti-democratic and dictatorial governments when UNP ruled the country. Look at the period of time when JR and Premadasa were the executive Presidents of this country. State media were always used as the propaganda organs of JR and Premadasa governments. Same was the case when SLFP ruled. All these politicians are the same, whether they come from UNP or SLFP. They are almost all corrupt and allow their henchmen to rob the country. Ministers, Deputy Ministers and MPs are a law unto themselves. Unfortunately that is the political culture of Sri Lanka and again and again Sri Lankans vote for these corrupt unprincipled bastards. No Naga, it is not the same when some do some work and make some money and some stright away steals whole sale!!! Not acceptable. Shame! shame! shame! UNP is copying Mahinda’s style of governance. This is why I keep on saying known devil is better than unknown angel. My knowledge of Mahinda after meeting him during his last leg of his presidency is that he is a great soul. He has very broader heart than the people think. Let us all work together to bring back Mahinda to the front of governance. He will do lot better than his presidencies. The ‘shopping goers’ such as amarasiri, native vedda, dcn, metilda ellepola etc., etc., for ‘yahapalanaya’ with hatred mind to others; can you please come out from wherever you have been hiding? Very irresponsible journalism by CT. Anyone who reads the State print media will see that it carries material about the opposition , MR etc unlike during previous regime. This shows that present govt not interfering in state media unlike when Mahinda was in power. State media was completely pro MR then! I support whatever the prest government does to prevent the Rajapaksa dictator and his bunch of thieves, drug dealers and murderers from grabbing power again in Sri Lanka. The Rajapaksa cronies are still in the media establishment doing their best to get their master back into power so what the Pm is doing is justified. Piranha, contrary to your belief, those who support MR too are citizens of this country. Teachers, soldiers, students etc. Some have given their sons, brothers and husbands to free their country from terrorism. You speak of them as if they are an alien species trying to take over your little bubble of hatred. The UNP leader could have broad-based the ownership of the Lake House and other state-owned media institutions when the party was in power.If he did it Chandrika would not have taken over the Media Ministry using her Executive powers Going by his recent behaviour, I wonder whether he was genuine when he went through the motions of presenting the Right to Information Bill in Parliament shortly before Chandrika dissolved the parliament. Ever since becoming the party leader Ranil got his ‘Royal’ buddies like Malik to hang around him. These buddies obviously have no feeling for the people. Nor do they feel their pulse. They are typical parasites interested only in feathering their own nests! Ranil has proved himself a stranger to ground realities -common sense in fact, when it comes to picking people for high positions. It is common knowledge among journalists now that his choice of the person as Lake House chairman is as bad his appointee as CB Governor. His buddy Malik, it appears, has already begun turning every advantage the party enjoys into a disadvantage! The UNP is sure to win the coming election, but Ranil will do his best to prevent it being a landslide! He is good at snatching defeats from the jaws of victory! who will say no to money? Come on….. Why is every media unit still hovering behind the ex- president???? They know where there money is and are following him to every temple and corner like dogs…………..
We had a brutal period during the 80s and early 90s (Ranil was minster then) then CBK promised “CHANGE” yet brought more of the same. The problem is that hardline Sinhala Buddhist can’t easily be convinced to vote for the party, Only is the option is to use Anti-Rajapaksa propaganda on the state media by mudslinging at them like how they did to the UNP when the party was in opposition. Now I think its the right for the UNP to abuse all-powerful state media to convince hardline Sinhala Buddhist and Nationalists to join the United National Party bandwagon. Only UNP has this option for the victory and safeguarding its the freedom and rule of law by abusing the State Media campaign and give no live streaming for Betrayed Sirisena and his muppets. Good rugby players don’t always make good politicians . Max. I do not have any credentials, just a nobody and never have I advised CT on what is journalism. With all due respect to your credentials, I am surprised that people of your calibre still go behind TSUNAMI HORA MARA and trying to hand over the reigns to a Criminal that he is starting from Tsunami funds to Murders and State plundering abd protection to Rapists, Drug Barons and murderers. If you are not able to fathom out this simple fact. I consider all your credentials not worth the paper it is written on.I will not call you a moron though. Cheers. This is very likely. I was interviewed last week one of the members of the editorial staff of Dinamina/ Silumina on the 20th Amendment and the forthcoming election. In my comments I blamed the UNP for not bringing 20th amendment to the Parliament. Similarly I commented that the sudden dissolution of the Parliament was a response for the COPE report that was scheduled to be tabled on July 7. I implied that the Prime Minister might have persuaded the President to dissolve the Parliament to hide the truth behind the bond issue. I felt the journalist was not happy about my comment. So I asked: “are you going to print it?” her answer was: “I ll try, but highly unlikely.” I added: “because I put the blame on the UNP?” She did not answer. Most likely she does not want to violate unwritten rules. She wants to please her bosses. Bosses must have given her “guide lines”. Bosses do not want to go against the present government hoping that partial withdrawal of your interview would place them in UNP’s good books. UNP might have given the bosses some guidelines. UNP must have offered them carrot or stick. We expect CT to act professional instead putting mud on UNP. Did MR pay you’ll money? Do you want CT to share it with you? In return what are offering to CT and ME? If Yahapalana regime is fast becoming like the Hora Mara Regime which it opposed outright in the beginning, might as well bringing MR regime back! Majority of us who voted MS into power are utterly disgusted! Not Ranil Wickramsinghe and not Mahinda Rajapakse, A third force should win the election. BBS has changed its name to Bodu Jana Peramuna (BJP) to be compatible with the other fellow racist party in the region, BJP (Bharatiya Janata Party). The little sister BJP in this island has already opted Cobra as its election symbol, fitting image for its venomous leaders. You are more than qualified to join him. I am sure he did not mean the Third Force should be the Porcine Spokesperson of the Orange Thug Movement.. He is a public racist and a war criminal. How have you come to those conclusions ? Read the excerpts from his interview with Steve Bell and make up your mind. On an interview with Sri Lankan TV he also said he would drag the clan all the way to Galle Face Green. What for? Anybody’s guess. One more thing, if another stupid ask the same question please copy and paste my comment below. 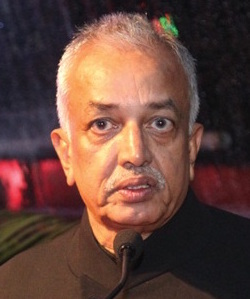 In an interview, Lt.-Gen. Fonseka talks candidly about the war, which he believes will be over in less than a year, and his views on the militant Tamil nationalism that has spilled from Sri Lanka into countries with ethnic Tamil diasporas, Canada included. In the general’s view, the war is driven by Tamils who want a homeland and have chosen Sri Lanka as the place. But he says the country’s ethnic Sinhalese majority will never allow the ethnic Tamil minority to break the island apart. Lt.-Gen. Fonseka is a competitive swimmer who won the U.S. Green Card lottery but has remained in Sri Lanka, heading the army he has served for three decades. He is lucky to be alive. On April 25, 2006, a suicide bomber attacked his limousine in Colombo. He was seriously injured in the assassination attempt and nine others were killed. The Tamil Tigers never claim responsibility for such attacks but were almost certainly behind it.